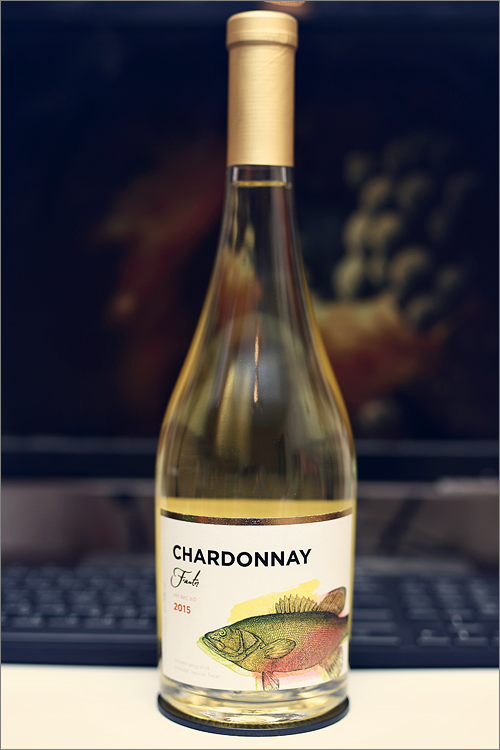 Tonight we are going to review a wine made of the noblest and the most famous vine variety of all – the royal chardonnay. In the 1980’s something extremely important to the history of wine happened, when the emerging new world wine industries introduced varietal labelling – calling wines by the name of their principal grape variety, as a result, chardonnay became a name more familiar to the world’s wine buyers than any of the geographically-named wines this vine variety had for centuries produced. But enough theory, let’s get back to the wine we’ve selected for the review today – Chardonnay 2015 from F’autor – a local winemaker famous for its high quality white wines. Straw green color with nuanced lime hues towards the rim. The nose is strong, filled mostly with mineral flavours and citrus fruit: wormwood, lemon, green apple, fresh cut grass, green pear, straw grass, lime, gooseberry, kiwi, oakwood, pear candy, underripe apricot, green grapefruit and some nuanced hints of limestone. The wine is medium-dry, with high alcohol level, high acidity and green but firm tannin. It tastes citrusy-mineral, refreshingly crisp and herbaceous, with a nuanced woody accent. This is a silky and sharp wine at the same time, with a fair overall balance between fruit, barrique and minerality, which is nice. It has a medium-plus finish and a balanced, a bit sharp and a bit green, aftertaste. This is definitely a great Wine of Moldova and the overall rating says the same, with 90.2 points scored it is right there, among the best wines we’ve tasted so far. Please click on the chart icon on the left in order to get to the wine rating page, where you can find all the wines we’ve tasted to date. Conclusion: this is a wine in its prime, ready to drink now, with a good ageing potential. It has a nice minerality and a nuanced citrusy profile. To be honest, this wine is surprisingly good – quite silky, fresh and a bit green and it pairs well with lemon dressed oysters or in coupé with some brie cheese. But if you want to achieve excellence, simply pair this wine with a roasted white fish wrapped in smoked bacon with lemon mayonnaise and asparagus – as this is an epic pairing indeed. Last but not least, we would like to mention that this wine has been awarded a commended award by Decanter World Wine Awards, which is very nice.